Canadian Mining Company Exits Pebble Mine Deal In Alaska, Leaving Project In Question Opponents of the mine are calling on the state's governor to stop the project. The copper and gold mine would be located on state lands near some of the richest salmon fisheries in the world. 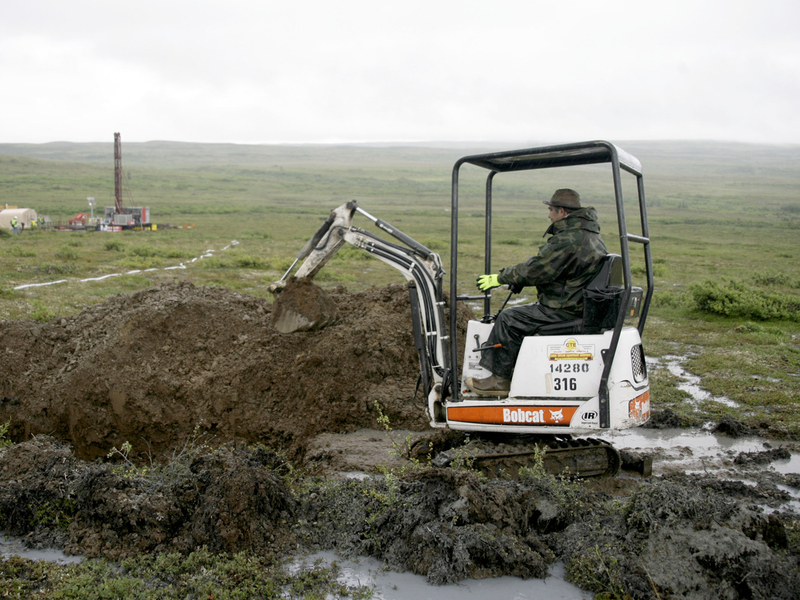 In this file photo, a worker with the Pebble Mine project test drills in the Bristol Bay region of Alaska. An investor, First Quantum Minerals, has pulled out of a partnership to build the proposed Pebble Mine near Bristol Bay, Alaska while the project is in the middle of a permitting process with the U.S. Army Corps of Engineers. Now opponents of the mine are calling on the state's governor to stop the project. The copper and gold mine would be located on state lands near some of the richest salmon fisheries in the world. Robin Samuelson, a chief for the Curyung Tribe in Dillingham and a commercial fisherman, says the company's withdrawal from the mining project is a victory for indigenous communities and commercial fishing groups that have been fighting Pebble Mine for years. "But I think the governor has the right to cancel [the] leases and I think now is the prime time," says Samuelson, a 67-year-old Yup'ik Alaska Native. Samuelson says he believes that without the financial backing of First Quantum Minerals, the project cannot meet the high environmental standards required by state and federal agencies. "The state is currently assessing how the withdrawal of First Quantum's support will affect the Pebble project. As they evaluate a path forward, we encourage the Pebble Project to account for local input from those whose lives and livelihoods could be affected." The U.S. Army Corps of Engineers environmental review of the project is underway and the Corps is preparing an environmental impact statement. The Corps recently extended the scoping and public comment period for the project until June 29. Pebble Limited Partnership CEO, Tom Collier, vowed to continue the project in a statement released after the news that the framework agreement between Northern Dynasty Minerals and First Quantum Minerals had been terminated. Collier stated, "Pebble remains one of the nation's most important undeveloped mineral resources. It is on state land and is an important economic asset for Alaska. Our project is well defined and we are going to continue communicating with Alaskans about why we believe in the opportunity it represents." Some indigenous people living near the proposed mine site have been supportive of Pebble Mine because they want jobs and economic development. "We need jobs in Bristol Bay, not everybody is a commercial fisherman," Samuelson conceded. "But we don't have to sell our culture, our heritage, and our ecosystem down the tube, i.e. through a mine." Samuelson is still working as a commercial fisherman and this year, he says, he will start the upcoming Bristol Bay sockeye season working with his four grandsons as his crewman. "I've never seen people united so strongly and so committed against a project like they are with the Pebble Mine," Samuelson says.